Would you like to try our NEW Plywood Builder? Q. How do you take a Columbia plywood panel and make it better? A. Simple. You make it wider. One foot wider, to be exact. Increase production efficiency with 5′ wide CFP60″s. 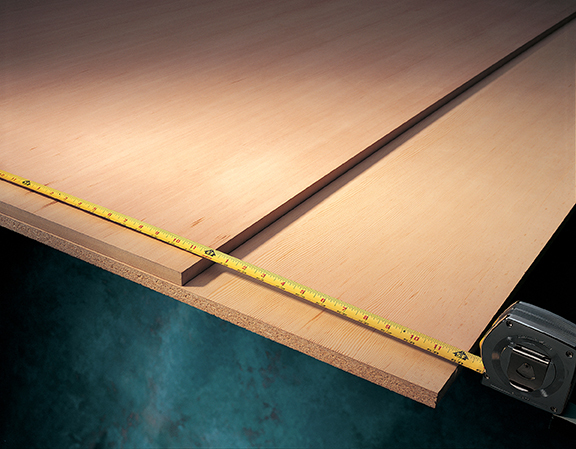 CFP60″s® is a line of 60-inch-wide hardwood plywood from Columbia Forest Products. Produced on Columbia’s innovative, new proprietary production line, these five-foot-wide panels can dramatically improve yield and reduce labor costs… which just happens to help improve profits. In fact, they’re the ideal option for manufacturers looking to lower raw material and labor costs, as well as reduce waste. Of course, having greater yield doesn’t mean much without quality. And like all Columbia products, CFP60″s are of superior quality. They’re available with either particleboard or MDF cores and manufactured using state-of-the-art technology. Plus, they’re available with most major rotary and plain sliced veneers, as well as paper backing, for options that make them perfect for almost any project. And with optimizing software, CFP sales reps and product engineers can assist you in determining the right combination of CFP60″s and standard four-foot panels to complete your projects with minimum waste. Better yield per panel for reduced waste and improved profits. Multiple core and veneer choices to fit a variety of applications. Large production volume for availability and quick delivery. Small unit quantities available so you only purchase what’s needed. Available in a variety of hardwood face and back combinations, including paper backing. For specifications calling for formaldehyde-free hardwood plywood technology, Columbia offers PureBond® CFP60″s which are constructed with no added urea-formaldehyde (NAUF) MDF. As with our entire PureBond line, these panels are compliant with LEED® NC 2.2 credit EQ 4.4 calling for composite panel products with no-added urea formaldehyde. Please contact your Columbia or distributor sales representative for more detail on PureBond CFP60″s.